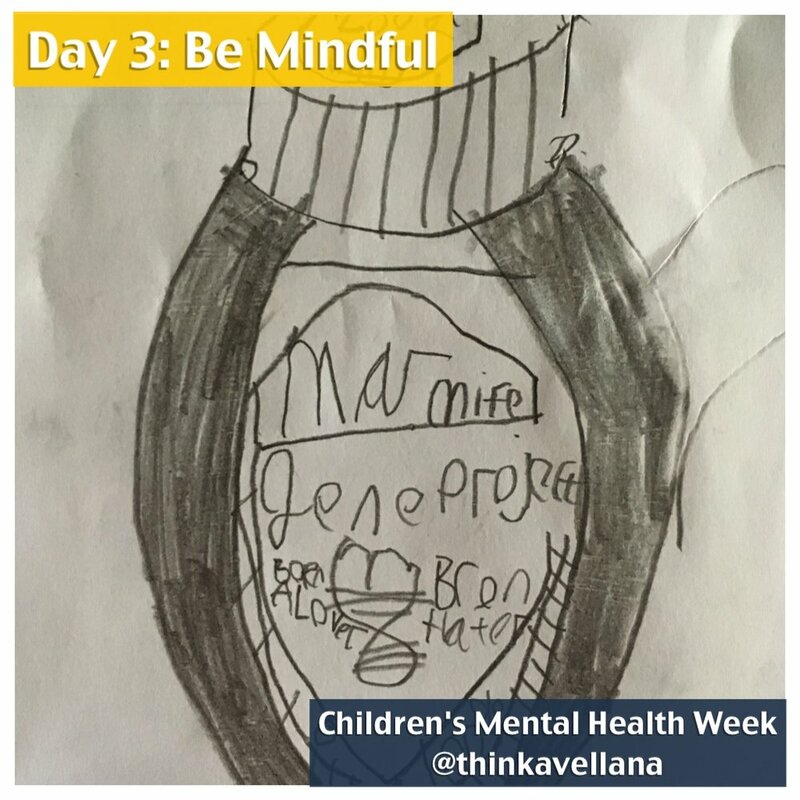 This week it’s Children’s Mental Health Week (#childrensmhw) and, at ThinkAvellana, we’re sharing simple ways to boost wellbeing in children. We hope parents, grandparents, carers, teachers - and anyone else who cares for children and young people - will find them useful. Our minds can be very busy, getting pulled into thinking about the past or worrying about the future. Finding ways to focus on what’s happening in the present moment is another way to build your child’s wellbeing. Here are three different ways to help children develop their mindfulness skills, which will probably work best if you join in too (especially if it’s younger children involved). Give everyone a pencil and paper, set a timer for 10 minutes, and draw something you can see. Bring your attention to the shapes, colours, and patterns. Look at the object from different angles. Challenge older children to see if they can spot when their mind’s wandering (or wondering!) and bring their attention back to the drawing. This activity isn’t about how ‘good’ or ‘bad’ the drawing is, it’s about whether you can focus on the activity and bring your attention back when it wanders. Younger children may enjoy this simple mindfulness technique for bringing attention to their breath. Ask your child to find their favourite small soft toy. Lay flat on the floor and invite them to put the soft toy on their tummy. Set a timer for two minutes, and ask them to watch how the toy moves up and down as they breathe in and out. This simple act of noticing the movement allows your child to remain “in the moment” for more than one moment. Older children (and adults) might enjoy watching this video from the Mindfulness In Schools Project. It’s a 10-minute mindfulness practice that uses a fun and playful animation. If you’ve got other mindfulness based activities that work for you, your family or school, we’d love to hear about them. Join the wellbeing conversation on our Facebook page. We’ve been sharing other ways to boost wellbeing in children on our blog here. It can be easy to feel other people’s lives are better than our own, especially when we’re bombarded with perfect images on social media. We can get stuck thinking others are more beautiful, have more money and fun, or simply ‘have more’. And children are just as susceptible as adults to this comparison trap. So how can we help them (and ourselves)? Get children into the habit of writing a short gratitude note when things have gone well, and putting it into a gratitude jar. You can encourage them by modelling the behaviour and doing it yourself (it may boost your mood too!). To help get you started, there’s a 40 second video on our blog. Older children may prefer to keep a gratitude journal, noting down the things they appreciate and the things that went well for them each day. It can include the positive moments they witnessed too - perhaps good things that happened to their friends that they want to celebrate and give thanks for. Find a time each day to chat about gratitude. Some parents like to do this before their child goes to sleep, prompting them to talk about what’s gone well that day. Some teachers build the chat into the end-of-school routine, by asking questions like ‘Tell me about someone who’s been kind to you today” or “Tell me about something you feel really thankful for today”. Building gratitude habits doesn’t mean we diminish, or lack a response to, the struggles and difficult moments that children experience. These moments are really important to talk about too. But, having a time in the day when you focus on the positive can be useful in helping children to keep their thoughts balanced. 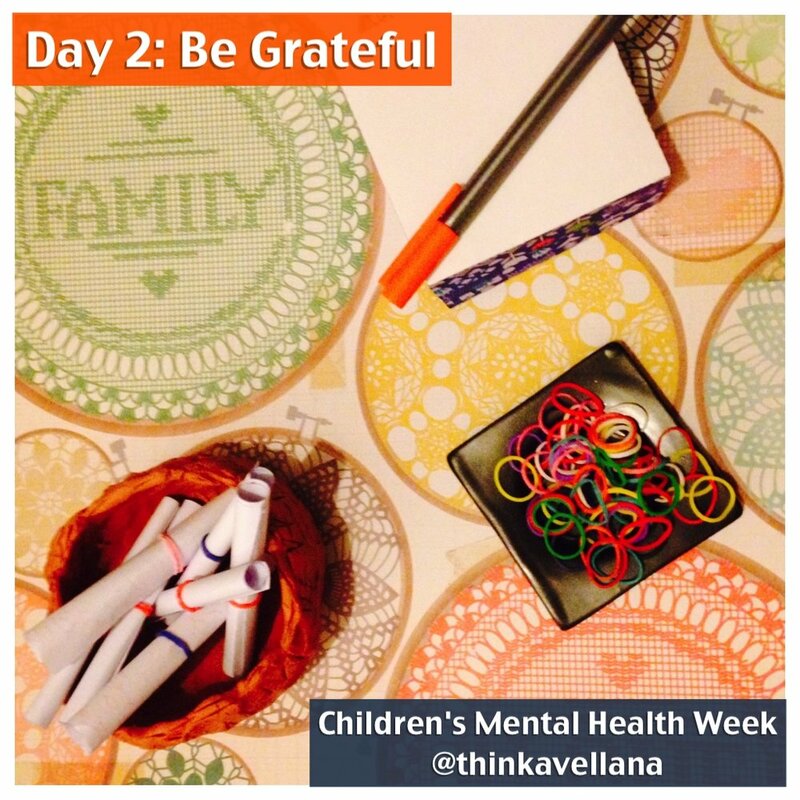 If you have a gratitude habit that works for your child, please do share it with us. And in case you missed it yesterday, we talked about ways to help your children build their strengths. Tomorrow, you’ll find even more ways to help your child build their wellbeing. Three Good Things. That's it!? Last year I wrote an article called ‘How To Teach Your Kids About The Brain’ that I hoped a few of my friends might see… to date, it’s actually been read over 100,000 times. I continue to get emails about it from people all over the world, commenting on my ideas and sharing theirs. Many adults tell me that they didn’t realise their brains worked in the ways I described - and that having this new understanding has really helped them. One of the ideas that has resonated with people is that naming emotions and brain functions can help us understand the brain better. Let’s focus on what I called “Frightened Fred” (which you might call Frieda, Froggy, or any other creative name you can think of). We are primed to take care of our own survival and that of our off-spring. Some days, Fred turns up the volume and we focus all our attention on these risks, potential dangers, failures and worst-case scenarios. Sometimes I listen to Fred. Sometimes I don't. How do we learn to turn down the hum of unhelpful negativity from Frightened Fred? In Woods, Froh and Geraghty's review of the gratitude research they explain gratitude as “noticing and appreciating the positive in the world”. This could include: the appreciation of other people’s help; feelings of awe when we see something amazing; focusing on the positive in the ‘here and now’ moments; or an appreciation rising from the understanding that life is short. Let me introduce you to Grateful Gerty, our brain’s gratitude representative. The research tells us that building up Grateful Gerty’s strength is associated with a whole host of benefits. Gerty can make Frightened Fred simmer down and reduce anxiety. Expressing gratitude provides a path to more positive emotions. People who express more gratitude have also been found to have better physical and psychological health. When we search for things to be grateful for, neuroscientist Alex Korb explains that this activates the part of our brain that releases dopamine (the feel-good hormone) and it can also boost serotonin production (low levels of this neurotransmitter are associated with depression). Or, to put it another way: on Halloween, Gerty’s the one handing out the treats. Gratitude can change our thinking habits. Regularly spotting the good things in our life can also make it more likely that (even when we're not looking for them) we see more positives. And gratitude works on a social level too. It can help us feel more connected to others, which in turn can improve our well-being. So how do you strengthen Gerty? Grab a journal and, before you go to sleep each night, write 3 things that went well that day and why you think they went well. Keep doing it for a week. That’s it. When I first read the research on gratitude, I felt like there must have been some pages missing. “So, they wrote about things they were grateful for, and then they…”? But no. It really is as simple as that. As Froh and Bono point out, we can be great at analysing why we’re anxious or sad. But when we’re happy, we don’t often stop to ponder why. Mainly because when we are experiencing positive emotions, it's a signal that all is well in the world; we can relax and enjoy ourselves. There will always be more important things than gratitude. Pets will need taking to the vets, reports will need to be finished, kids will need feeding, cups will need cleaning… gratitude can quickly fall down the ‘to do’ list. But that’s the challenge with taking a proactive approach to well-being. It’s hard to prioritise because you can’t easily see the things you’re preventing. You may be preventing the onset of depression or anxiety. You may be moving yourself further up the well-being spectrum towards thriving. But scientifically, it would be very hard to prove that. Be a scientist of your own world. Just like we know why it’s good to eat healthily and exercise, my mission is to help share the research on ways that we can all take better care of our well-being. I want people to have access to evidence-based ways to improve their mental health. Some of these ideas might work for you, some of them might not. So, what I’d encourage you to do is this: become a scientist of you own life, and if you decide to try keeping a gratitude journal, observe how it feels for you. And maybe, just maybe, Gerty will give out some treats. Recently, while browsing through the stationery section of a big department store, I was struck by the number of notebooks and journals with messages written on the front. The research on priming demonstrates what happens when we're faced with the same message regularly: our thoughts, feelings and behaviour can all be influenced. There’s plenty of evidence for how athletes use this idea of priming to their advantage. Some of the inscriptions on the journals said ‘Be Happy Always’ or ‘Don’t Worry, Be Happy’. They were beautiful, pastel-coloured journals, embellished with gold pineapples. But something about them made me feel a little uncomfortable. I wondered about the effect of these messages. I’m a big advocate for positive psychology and ways to enhance well-being. My training in clinical psychology has also allowed me to study the importance of the (so called) ‘negative emotions’. We can’t be happy all the time. This just isn’t a realistic goal and, while I imagine that the makers of these beautiful journals understand this, they also know we're seduced by the idea that a permanent state of happiness is attainable. We've been gifted with such an amazing spectrum of emotions, and they all have an important place in our lives. Imagine if we didn’t allow ourselves to feel all those emotions. If we weren't sad when someone shared devastating news, or weren't worried when our teenagers didn't come home after a party. When we try to aim for 'happy all the time' I think we can also open ourselves up to self-criticism - and close the door to self-compassion. I loved the editorial in the latest Flow magazine (Issue 15), where Irene and Astrid talked about aiming for ‘good enough’ and not trying to be superhuman and brilliant at everything. Barbara Fredrickson’s groundbreaking research on positive emotions revealed the importance of negative emotion in our lives. She has found enough data to support the idea that there's an optimal ratio of positive to negative emotions. Achieving this ratio makes it more likely that we can build positive relationships with others and strengthen our resilience and well-being. The magic number is 3. If, on average, we can achieve 3 positive emotional experiences to every negative 1, her theory suggests we are building our well-being. Notice that she doesn't suggest a ratio of 3:0. So, perhaps the Be Happy Always journal could have a little sub-heading "Except on the 1 out of 4 occasions that you aim not be happy"? After some searching in that shop, I came across a journal with ‘I’m doing my best’ on the front cover. To me, this seems like one of the most important messages to use to prime my brain. There is comfort and compassion in this phrase, since it allows for the good days and the not-so-good ones. It motivates me when needed, but also quietly sits alongside me on the days when "my best" might not feel very productive. I handed the journal to the cashier. ‘Cute’ she said, scanning the item. I smiled, ‘Cute... and realistic’ I said. If you want to discover your positivity ratio you can take Fredrickson's evidence based assessment here. If it's not as high as you'd like, be gentle with yourself (perhaps even try saying 'I'm doing my best'), stick with me and find out what the research says about how journals can improve our positivity in my next blog post. When I first saw Shawn Achor’s Tedtalk, I knew that something exciting was happening. I stopped everything. I watched it again. I rushed in from my office to show it to my husband. He watched it and at the end, smiled and said ‘Hey, he just said what you’ve been saying for the last few months’. I think we need to start teaching our children about emotional wellness. Children should know as much about their emotional health as they do their physical health. If you ask a 10 year old what being healthy means, they can tell you: eat five-a-day, exercise, and get plenty of sleep. But what if we ask them what emotional health is? Do they know about that? Statistically, in a class of 30 children, 3 will suffer from a diagnosable mental health problem. So here’s the plan. I’m going to share what I’ve learned from my work as a clinical psychologist, both from the research and from my experiences with children and families. I’ll talk about the useful ways we can teach children about how our brains work, the safe ways to explore about ‘big’ feelings and how we can help them develop emotional intelligence and reduce their risk of mental health problems. If you know of other parents who might be interested in learning this, please let them know about ThinkAvellana too. But for now, I start my journey by sharing Shawn’s TedTalk with you. He figured out the Happiness = Success equation: the first steps towards a bright future.